Future Habitat homeowner Jennifer Wenzel applied to the program looking for an opportunity to provide her family with a safe, decent, affordable place to call their own. Roughly ten years ago, Jennifer joined the United States Army and served as a cook in the food service department. While stationed in an imminent danger area Afghanistan, Jennifer was injured during a firefight. 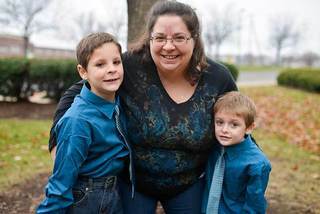 Upon returning home, Jennifer and her two sons moved in with Jennifer’s parents while she recovered from her injuries. While Jennifer is thankful to be alive, her injuries resulted in many life changes including new physical limitations. Jennifer was unable to maintain her job as a lab technician and she has difficulty maneuvering around her parent’s home, specifically when it comes to climbing the stairs to her room. Jennifer is very appreciative of her parent’s assistance over the past years, but is ready to regain her independence and provide her sons with a place they can permanently call home. Connor is eight years old and loves to swim and his little brother, Corbin, is a ball of energy who is enjoying pre-kindergarten. Jennifer often talks about her love of cooking and baking and how helpful both boys are in the kitchen. The family looks forward to the day they can bake their favorite treats together in their own kitchen.